These adult editions of J.K. Rowling's Harry Potter novels have been stylishly redesigned to showcase beautiful jackets by renowned woodcut artist Andrew Davidson. 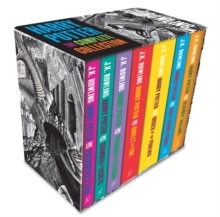 This spectacular box set includes all seven novels and is perfect for Harry Potter novices and collectors alike. Contains (in reading order): Harry Potter and the Philosopher's Stone, Harry Potter and the Chamber of Secrets, Harry Potter and the Prisoner of Azkaban, Harry Potter and the Goblet of Fire, Harry Potter and the Order of the Phoenix, Harry Potter and the Half-Blood Prince, and Harry Potter and the Deathly Hallows.